Liberty spikes is styling hair in long, thick, upright spikes. The style, now associated with the punk subculture, is so named because of the resemblance to the spikes on the head of the Statue of Liberty. Liberty spikes trace their origins to the Ancient Britons. Warriors washed their long hair in lime water, which also bleached it blond. This hairstyle was highly symbolic as a badge of honor and manhood: Celts were not allowed to spike or cut their hair until they had killed an enemy. After the subjugation of Britain spiked hair fell out of use in favor of short Roman haircuts. In the silent film era some actors, like comedian Harold Lloyd, experimented with spiked hair to stand out from the crowd, although this trend did not catch on with ordinary people. This changed in the 1970s when the emerging British punk subculture chose messy, choppy hair in reaction to the long smooth styles worn by hippies and disco fans. Originally the spikes were small, as worn by modern-day pop-punk fans, but by the 1980s this had evolved to tall liberty spikes, sometimes over a foot in length. Liberty spikes were also worn by the Goth subculture, although in this case they were dyed black instead of the bright unnatural colors favored by punk rockers. There are also liberty spikes that make use solely of front spikes to look more like the crown of the Statue of Liberty than a proper mohawk. This type of styling is not easy by any means. Those who do it, spend anywhere from one to two hours, and they must be done every day because it can be very disturbing to sleep with. This form of liberty spikes is also known as a crown. In this style, the hair is formed into thick spikes that may radiate outwards in all directions or all point up in the same direction. They are favored for their durability in extremely long hair. Liberty spikes may be enhanced by the use of hair dyes. Liberty spikes are also a common way of styling mohawks. Forming and keeping the shape of liberty spikes is beyond the capacity of some hair styling products, which were created for more natural looking styles. Irish berserker Slaine Mac Roth is well known for his spiked black hair. Various anime heroes have liberty spikes, including Yugi Mutou from Yu-Gi-Oh!, Son Goku from Dragon Ball, Vash the Stampede from Trigun, Kenpachi from Bleach and Brock from Pokémon. In Dune the villain Feyd-Rautha Harkonnen (portrayed by Sting) has spiky orange hair. Salvador Dali in the 1950s made a spiky hairstyle for a model. David Bowie in the 1970s. Sid Vicious in the late 1970s. Johnny Rotten in the late 1970s. Billy Idol in the 1980s. Alan Barton of British pop group Black Lace. Brad Pitt in 1995, later somewhere around the late 1990s and early 2000s, then again from 2005–09. David Beckham in the early 2000s. Thom Yorke in 1995-96, then again in 2003–04. Chester Bennington, Mike Shinoda and Joe Hahn from the American rock group Linkin Park. Benji Madden from American pop punk group Good Charlotte. Tech N9ne was known for his red liberty spikes in the early 2000s. 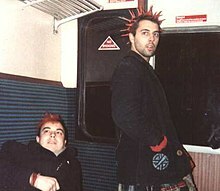 Jimmy Urine was known to sport the liberty spikes in the early 2000s for the band Mindless Self Indulgence. Brody Dalle was known to have liberty spikes during her time in the band The Distillers. Mikhail Gorsheniov in the late 2000s. Wikimedia Commons has media related to Liberty spikes. ^ "Celtic Origins". www.jillsfamilyancestry.co.uk. Retrieved 2018-07-04. ^ "Maui Celtic - A Celtic History resource on Maui, Hawaii". www.mauiceltic.com. Retrieved 2018-07-04. ^ "An Introduction to Celtic Tattoo Mythology page 1". www.tribal-celtic-tattoo.com. Retrieved 2018-07-04. ^ Thomas, Pauline. "1970s Punks Fashion History Vivienne Westwood, body piercing". www.fashion-era.com. Retrieved 2018-07-04. ^ "Punk Hairstyles - Spiked Punk Mohawk". 2016-04-09. Retrieved 2018-07-04. ^ # ^ Tobin, Joseph Jay (2004). Pikachu's Global Adventure: The Rise and Fall of Pokémon. Duke University Press. p. 182. ISBN 0-8223-3287-6.